Modern, attractive streamlined product design with new improved durable pump. Unit constructed from high quality metals, i.e., Stainless Steel and powder-coated Mild Steel combining excellent product durability with overall upmarket finishes. New pump constructed from chrome plated brass material. Lockable - incorporates unique automatic Serra Snaplock locking system - vandal resistant with universal Serra Barrel key. 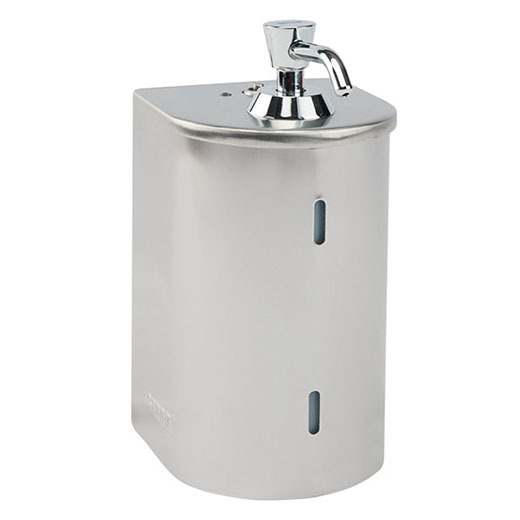 Convenient bulk fill/conventional "Top Up" dispenser - large 1 litre capacity providing an economical and cost-effective liquid hand soap dispensing system. Two (2) inspection slots for easy liquid level checking. Serra back plate designed for easy and quick mounting of unit. Easy-to-use pump activated soap dispensing - gravity fed, no leakages. Pump and valve constructed from high grade durable materials - increased product reliability and reduced replacement costs. Full twenty-four (24) month replacement guarantee.